Dubai: Horse racing is a sport where every single race matters, every horse a genuine competitor and every rival a serious threat. It’s a sport where every detail counts and where every action can make the difference between winning or risking defeat. This is what the 2018-2019 UAE flat racing season was all about. This is what it will be remembered for. From the champion thoroughbreds and Purebred Arabians that made our hearts beat faster to the racing authorities who worked assiduously to create the right conditions in which the sport could flourish. We were indeed, privileged to have been part of the UAE racing fabric that majestically delivered both on and off the country’s five racing tracks — Meydan, Jebel Ali, Abu Dhabi, Sharjah and Al Ain. From the time Dubai World Cup-winning jockey Fernando Jara teamed up with his boss Ali Rashid Al Rayhi to win the first race of the season back on October 26 at Jebel Ali Racecourse with a horse, appropriately called Hello, we knew that were in for one heck of a ride over the next six months, until the curtain finally came down at Meydan Racecourse on Friday evening, with a mouth-watering seven-race card. Seeing what sort of an impact horse racing can have on the UAE community really drives home the fact that this is a sport is going from strength to strength. And with His Highness Shaikh Mohammad Bin Rashid Al Maktoum, Vice-President and Prime Minister of the UAE and Ruler of Dubai, in the driving seat, the sky is the limit. For the record, hard-working Irish jockey Tadhg O’Shea and his principal trainer Ernest Oertel won their respective championships while prolific Emirati breeder-owner Khalid Khalifa Al Naboodah annexed the coveted owner’s title. O’Shea, who peddled his wares at all the country’s five tracks amassed 48 winners while earning in excess of Dh7 million for his owners. Richard Mullen finished second best in the race of the hotly contest title with 43 winners and prize money exceeding Dh8 million. Al Naboodah, whose passion for racing and breeding knows no limits, enjoyed a stellar season which saw him lead in 53 winners for prize money upwards of Dh5 million. O’Shea, Oertel and Al Nabooda capped their unforgettable season by winning the $1 million Dubai Kahayla Classic (PA H1), one of the most sought after prizes in the world of Arabian racing. O’Shea summed up the season paying tribute to his friend and rival, Mullen, and the people who have kept faith in his ability and supported him with many rides. “It’s great and I had a tremendous year,” he said after accepting the jockey’s trophy. “Obviously it was a great tussle with Richie the last month and to come out on top was very satisfying. The highlight of the season would have to be the historic victory of Thunder Snow in the $12 million Dubai World Cup (G1) at Meydan on March 30. 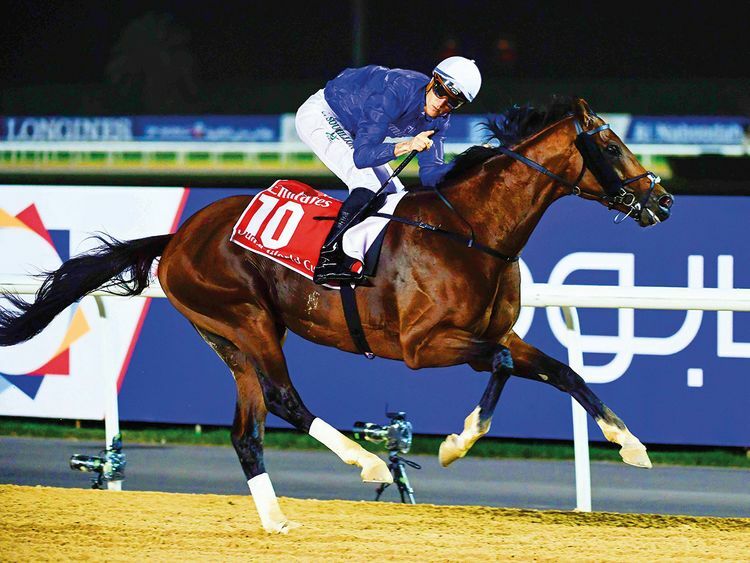 Beaten in his prep race on Super Saturday, Thunder Snow seized the big stage to claim his share of racing greatness when he overcame a bad draw and some of the best horses on the planet to win in a thrilling finish and lock up a record second consecutive Dubai World Cup. The crack team of trainer Saeed Bin Surour and big-race Belgian jockey Christophe Soumillon revelled in their chemistry to claim the UAE racing’s season’s most coveted award. It is clear that Shaikh Mohammad’s investment in horse racing, around the world, and in Dubai, is delivering the results. See you next season.